You are here: Home » It’s Been a While! Yep, I know – it’s been too long! I can guarantee you that I haven’t been idle in the kitchen – I’ve actually been really busy cooking away! I’m doing a lot less baking as the weather is slowly getting warmer and I’ve been doing a lot more cooking – but not a lot of it particularly blog-worthy. Yet. As the season is getting warmer, it’s time to bring out the ice cream maker again. Wheeee! Not that it has stopped me in the winter – but now I have opportunities to bring a pint or two over to friends to enjoy. There are a few times in the year when ataulfo mangoes are ripe – it’s a short season but I try and take advantage of it by eating as many mangoes as I can. This year I decided to make a mango sorbet. This dairy-free treat can be just as amazing as their more creamy cousins, but the trick is to get really ripe fruit. Again, consider that the flavour must concentrate, so anything less than taste perfection is unacceptable. A local market was selling “ripe” mangoes for 99cents/lb (vs the more firm less ripe ones for double the price) – I promptly picked up 5. Martha Stewart (of course) has a fantastic recipe for sorbet – which is essentially 2 cups of fruit puree to 1 cup of sugar syrup. 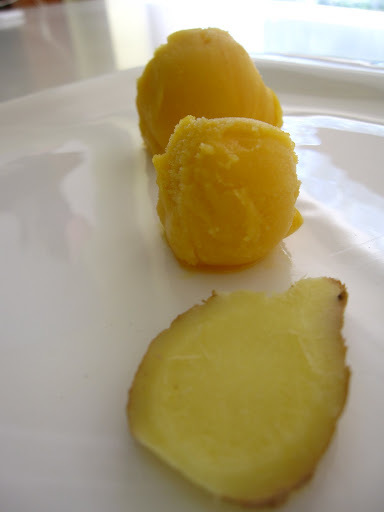 For the mango sorbet recipe – it was 2 cups puree + 1/4 cup water + 1 1/4 cups simple syrup. I sliced up some fresh ginger and infused it into the simple syrup to give the sorbet a bit of a kick – and yes, it was delicious! ← Mmmmm…cookie. Shiba approved (not tested). I've been wondering when you'd post again. Your mango sorbet looks SOOO delicious! You never cease to amaze me with the things you can conjure up in the kitchen, BA!